In the past few weeks there's been a pleasing trend of download developers including the Nintendo Switch in their multi-platform release plans. No doubt helped along by the system's support of Unity and Unreal Engine 4, some studios in the Indie space are embracing Nintendo's upcoming system. The latest to do so is Villa Gorilla, a development team based in Stockholm (Sweden). Yoku's Island Express is an 'Open World Pinball Adventure', combining exploration with some rather clever-looking mechanics. You can see a description and trailer below. 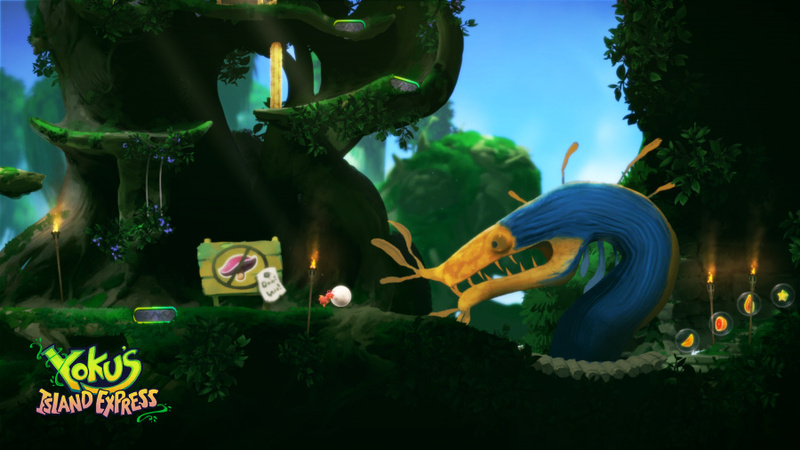 Yoku's Island Express is an open world/metroidvania-style pinball adventure, Seamlessly blending platform navigation with pinball mechanics across a large open world. Yoku the dung beetle sets foot on the beach of Mokumana Island, ready to take on the duties as the new postman. But the ancient island God is trapped in a restless sleep and the islanders are plagued by quakes and storms brought forth by its nightmares. 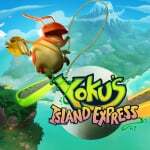 Yoku's Island Express is a unique and quirky adventure with handcrafted visuals, where you'll soar through the air, vacuum explosive snails, fight a Screetch, feed starving lemurs, discover the mystery of the Fruit Altar, wake an old god, and hopefully help tiny Yoku rebuild the island post-office. It's not due for release until Winter 2017/2018 but certainly looks rather promising. We're looking forward to it 'rolling out', in any case. You had me at "Pinball". Video looks nice and it's an interesting premise. Have to admit, it looks pretty cool! Love Pinball, Love open world, never thought of how the two could combine. Looks amazing, want it. That looks really good! The headline had me scratching my head but the video really sold the concept to me! There are at least 20 games I want for switch this year, I fear after 03/03 my ps4 will think its power cable has been cut! This looks fantastic. Day 1 buy for me. You had me at "heroic dung beetle ". Read this as 'Yoshi's Island Express' and got overly excited. Still looks great. Sonic Spinball anyone? Anyway this is the kind of thing that excites me more than Zelda and triple A stuffs. Nice. I started loving pinball games on my 3DS and this looks awesome will definitely be checking this out . Not sure why but this really reminded me of lion king on the snes. maybe it was a combination of the music and the levels. @iGen But it's a heroic dung beetle. Wait... SLIGEACH_EIRE actually had a positive comment? The apocalypse will come! Yay more indies means better switch games in general! @NewAdvent Yeah, there is a lot of crap out in indie world but sometimes you get a dung beetle of a gem. Game's logo is a shameless Yoshi's Island rip-off..
@ThomasBW84 As somebody who wrote an entire article explaining how the Switch launch can't be considered "soft" b/c you read in a tech manual in your first job out of Uni what the IT specific definition of "soft launch" is, I object to your use of the term "open world ... adventure" to describe a 2D game. Everybody knows "open world" in video games the past decade implies 3D, a 2D game can't be considered "open world", this isn't Yooka-Laylee or that snake physics game. But it's a dung beetle. I read this as Yoshi's Island at first and was very, very confused. @rjejr Note the quote marks, that's how they're pitching it. "As somebody who wrote an entire article explaining how the Switch launch can't be considered "soft" b/c you read in a tech manual in your first job out of Uni what the IT specific definition of "soft launch" is"
It was my fourth job and I worked in that area, didn't just read a manual. It was also very boring work, so I went back to being an impoverished writer after a few years doing it. Whether that was the right move? Well, that's debatable. Pinball with a story? Very interesting, I like it. We'll see how it shapes up. @ThomasBW84 "Whether that was the right move? Well, that's debatable." On come on you know you love it here. I have a graduate school Masters Degree and I'm A.B.D. - all but dissertation - meaning I've completed all of my exams and course work for my PhD, just never finished the doctoral dissertation, and you know what I've done w/ all of that education and student loans? Stay-at-home dad, 15 years next month. My only regret is taking out of all those student loans. Oh, and I saw the quotes and that it was from the article, I was just annoyed watching the vid that it was 2D. Here's a more ethical question I think your brain would like to ponder w/ Ant and damo - since that Switch was stolen, and you guys seem unhappy in general w/ all of his leaks, shouldn't you take the offending vids down? If he's exposing "stolen" IP info about the OS aren't you no better than people on Napster "sharing" "stolen" goods? I don't have a definitive answer, IANAL, just something I've been pondering since that Nintneod PR article went up this morning. You are directing traffic to his Youtube channel were he is making money off of stolen merchandise, doesn't that make you guys accessories to stolen property? The people who ran Napster and other pirate hubs always claim they are doing nothing wrong but they usually get in trouble for assisting in the distribution of stolen merchandise or some such. "Napster is guilty of contributory and vicarious infringement of the plaintiffs' rights to intellectual property, which were routinely traded by means of Napster's on-line facilities"
I don't have the answers, just raised a flag in my head how much you guys are promoting his vids while basically declaring him a criminal, yet posting links to all of his vids and getting hits off of it yourselves. It's probably legal, but it feels wrong. @rjejr Maybe, to be honest I haven't had time to think about it today (I was away doing other things late last week, I'm still catching up). Will look over the articles on it, see what videos still exist and so on. As I said in the editorial before these vids on why we didn't post excerpts from the Nintendo dev document that was dumped online, finding 'the line' is always a headache and is relatively subjective, in a way. What's public consumption and otherwise is awkward. When the initial unboxing and UI vid went live at the weekend the uploader claimed it was 'shipped early'. I thought BS, and Damo made a joke that "if you believe that we have some magic beans for you". So there was the instinct that it was lifted; my initial theory was that a retail employee had unboxed one and would return it to store shelves, for example. Now that it's factually clear it was nicked, it may be an idea to go through those articles and remove the videos, I'll take a look and decide one way or another. @ThomasBW84 damo always seems to know things, I feel like I've lost more arguments w/ that guy than anyone else in my life, not b/c he's better at debating than I am, but b/c somehow he knows stuff I don't. I'm sure a dozen arguments can be made for you guys keeping all of those links up and I'm sure your owners legal team has already looked into it, it's more a feeling of hypocrisy and I hate that more than anything. Lots of sports on TV in the US refuse to show someone running onto the field during a game b/c they finally realized those people were just doing it for attention so the broadcasters wouldn't give them any. Less streakers now. People who steal things pre-launch just to put up videos on their YT channel to get views shouldn't be linked to promoting their theft, but that's probably just my moral sensibilities and not anything legal. @rjejr Well, they're conversations we'll have as an editorial group, anyway. I appreciate your viewpoints on it, these things are always a headache, frankly, and ripe for disagreement. It's always case-by-case, but we'll hash it out and decide on something. @rjejr FYI we've talked it over and I've revisited those articles. @ThomasBW84 Sorry you have to come back to work and find me still here waiting for you, I've been trying to lay low for awhile but low for me is oppressive for others. Guess I'll go re-read old articles since you did some work. I misread the title as "Yoshi's Island"! Thought it said "Yoshi's Island" for a sec and got excited for nothing. @iGen It's a shame in this day and age to see such unabashed dungism. Screw Zelda, this is clearly the real system seller! I never thought I'd see the words "Open World" and "Pinball" together. We're really venturing towards the future here. They spread diseases, you know. I was playing this safe but when I might take a chance after I seen the trailer. I wonder if it'd get annoying if there were precision segments, but eh pinball is pinball. I'd buy this. @IceClimbers If this is a system seller then 1-2 Switch is game of year! But seriously I'd buy this. Looks polished enough. Also I should add that it wasn't mentioned in the article that Villa Gorilla are made up of ex-Starbreeze developers and have worked on games like The Darkness and The Chronicles of Riddick: Assault of Dark Athena. Two great games that I loved so I'm looking forward to playing this.